BAD WORLD is a one-woman autobiographical coming-of-age musical influenced by jazz, folk, and musical theatre genres that features Kylie Jenifer Rose of Crave Theatre Company. Currently in development, this project has music and lyrics by Kylie Jenifer Rose and James Liptak and a book by Emilie Landmann. Inspired by the “Me Too” movement, BAD WORLD explores a range of themes including solo travel, conservativism, feminism, and sexual assault. 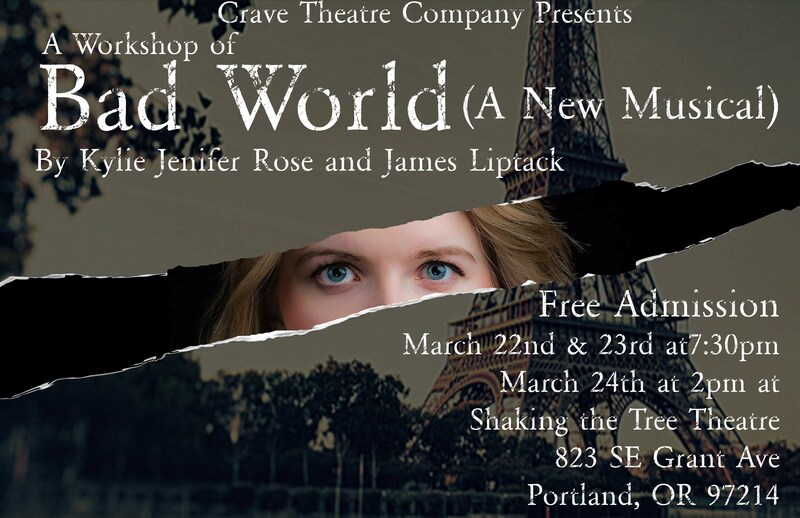 Crave Theatre Company’s Open Space Residency at Shaking the Tree Theatre will culminate in a sitzprobe-style reading of BAD WORLD from March 22nd-24th, 2018 to gather audience feedback that will help to inform further development for a fully staged production in 2020.